Juniata’s chemistry department is composed of faculty and students with diverse talents and interests who work together in lecture halls, group problem solving sessions, laboratory coursework, and research experiences. Juniata’s chemistry department is committed to teaching chemistry as an exciting and cohesive experimental science from your very first introductory course. Instead of focusing on one aspect of chemistry at a time, your introductory courses – the Integrated Chemistry series – will weave together important concepts that form the basis of the five sub-fields of chemistry – organic, inorganic, physical, analytical, and biochemistry. Chemistry faculty with expertise in all fields of chemistry are involved in designing and teaching the Integrated Chemistry series, which students complete over their freshman and sophomore years. Before you finish your first two years, you will have developed hands-on laboratory skills, practiced your problem solving abilities, and applied your chemical knowledge to solving real-life problems. In later courses, you will study each of the sub-disciplines of chemistry in more depth, building upon knowledge and skills that were emphasized in the Integrated Chemistry series, and you will begin to work more independently in the classroom and the lab. But learning at Juniata does not stop at the classroom door. 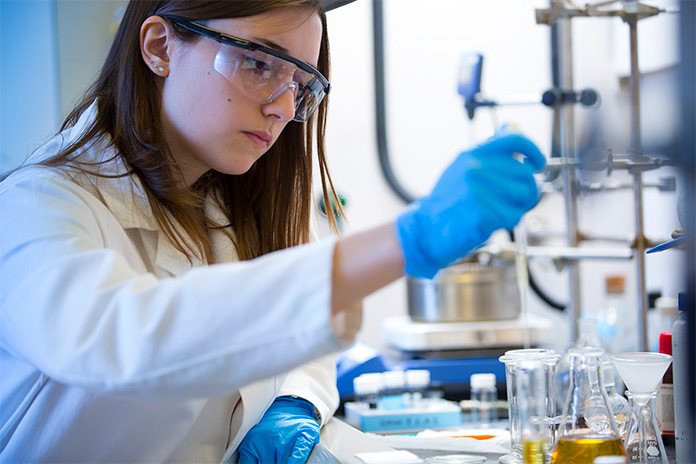 As a Juniata chemistry student, you will have the opportunity to do hands-on original research side by side with chemistry faculty as early as your freshman year. Unlike at many large institutions, you will interact closely with a faculty mentor as you engage in chemistry research, and you will learn to use state of the art instrumentation to solve chemical problems. Juniata’s chemistry department is composed of faculty and students with diverse talents and interests who work together in lecture halls, group problem solving sessions, laboratory coursework, and research experiences. As a member of this community, you will gain knowledge, practice scientific communication, and solve complex problems – experiences that will leave you uniquely prepared to enter the chemistry workforce.